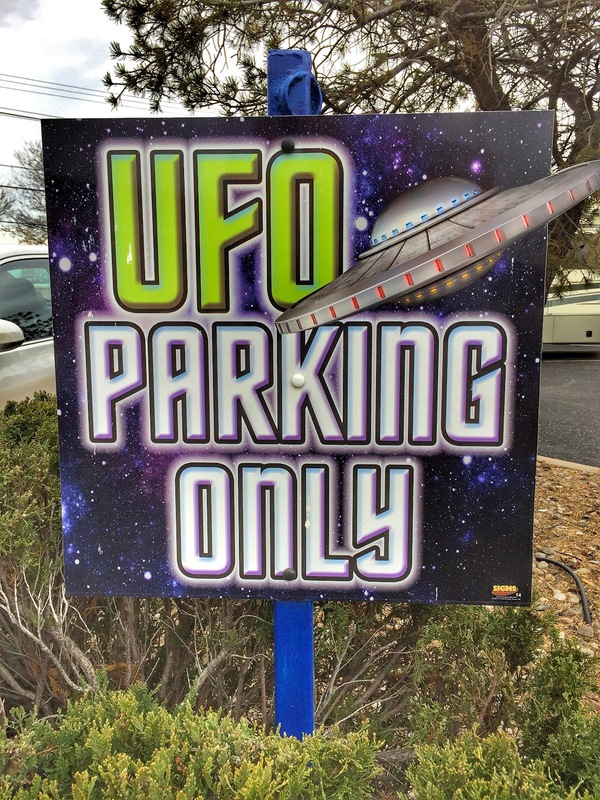 "It's the biggest small town you'll ever visit," the hotel desk clerk told us last night when we asked about restaurants in Roswell. Truer words have rarely been spoken. Arriving just before dinner time, we searched Yelp for restaurants, finding only a tiny fraction of what we'd expect in a city of almost 50,000 people. The same was true of retail stores. One Albertson's location and a small Farmer's Country Market are the only grocery stores offering competition to the local Walmart. 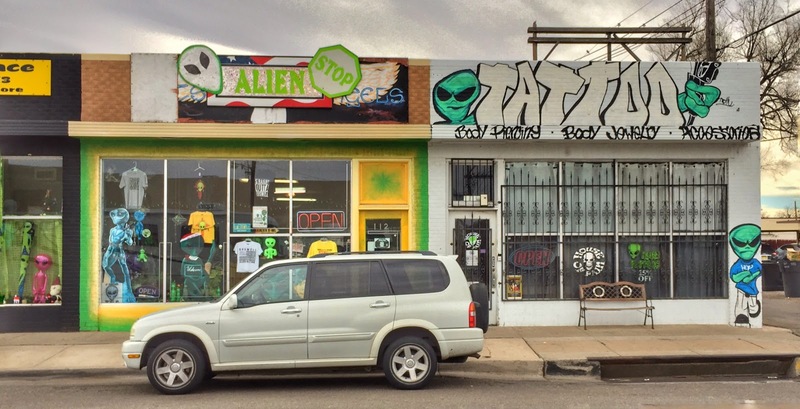 What Roswell does have in abundance is aliens. Bright green creatures with oversized black eyes stare out from car dealers, fast food restaurants, tattoo parlors, and donut shops. 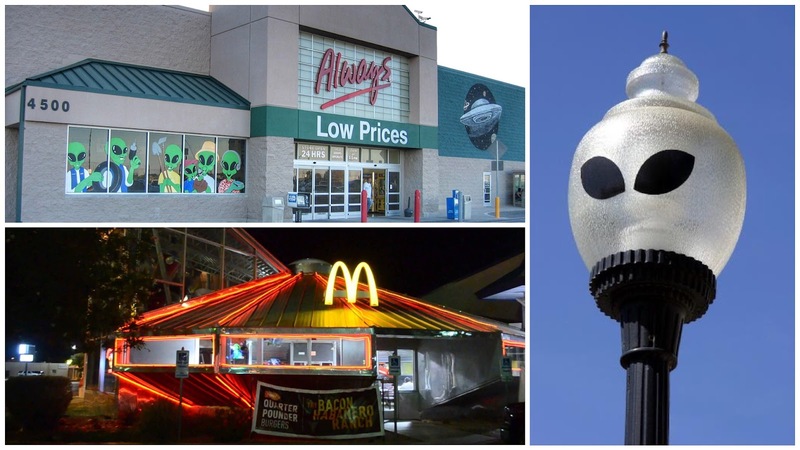 Even the street lights in certain parts of town are tricked out to look like aliens. When we jokingly asked the hotel desk clerk what planet he came from, he replied that he'd have to cut out his tongue to be able to pronounce it in his native language. 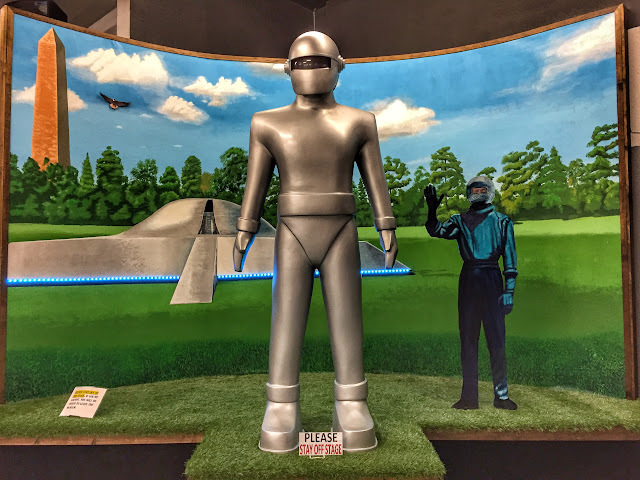 Why all this talk about aliens in Roswell? An alleged sighting of a UFO crash was reported around town in the summer of 1947. When the local air force base assured the public it had been an ordinary weather balloon, the incident was soon forgotten by most people. 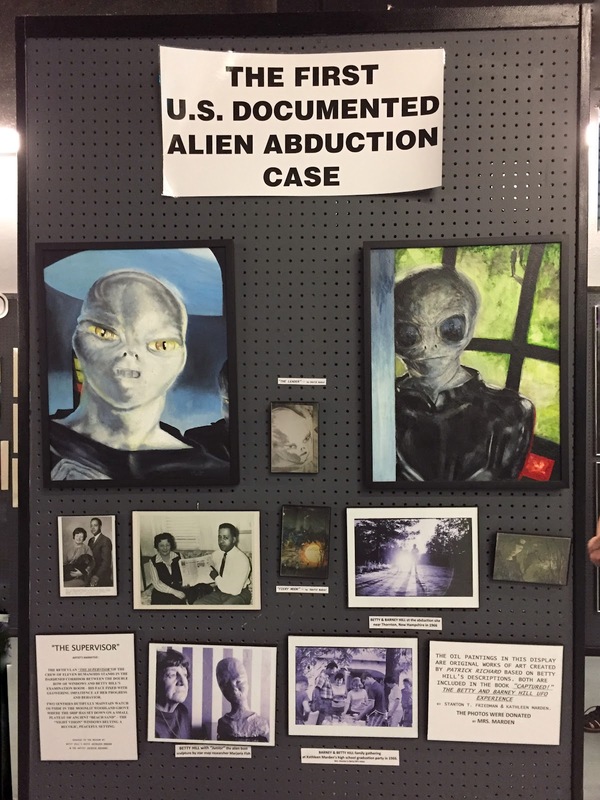 Interest was re-ignited in the late 1970s when UFO fanciers began to develop detailed conspiracy theories suggesting that not just one, but multiple crashes had occurred near Roswell. Moreover, the military was said to have recovered the bodies of the extraterrestrial creatures and engaged in a cover-up to conceal the incidents from the public, according to the hype. 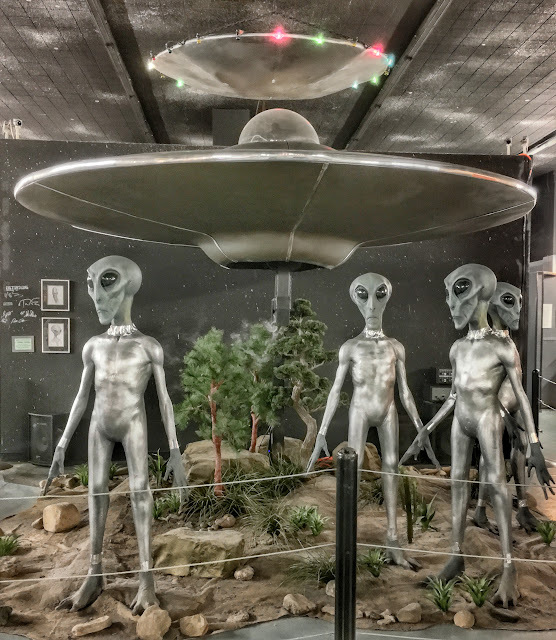 As interest in the topic grew, believers, questioners and curious tourists began to flock to Roswell to check things out for themselves. 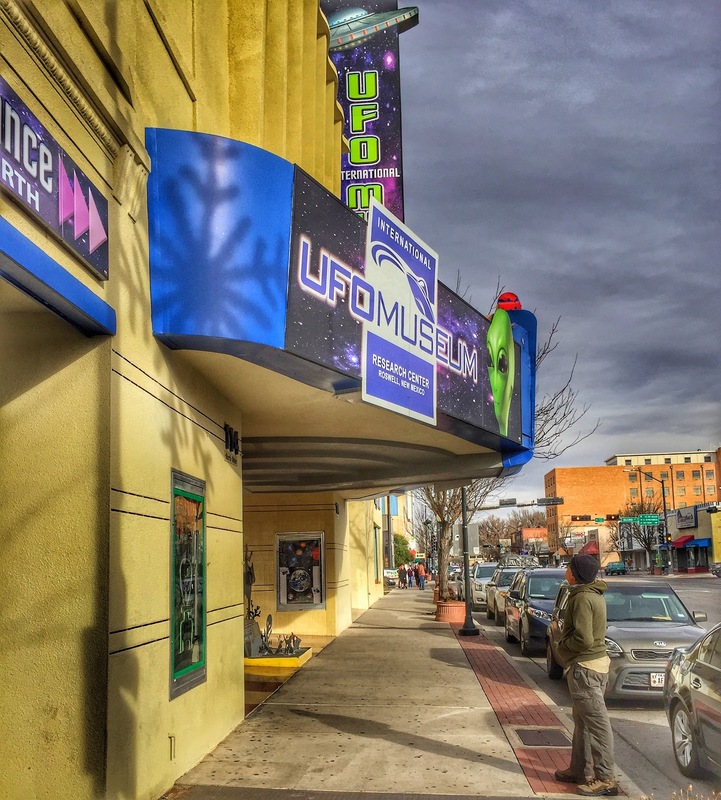 Capitalizing on this boon to the local economy, the International UFO Museum and Research Center opened its doors in an old movie theater in 1991. Taking the bait, we also made a beeline for the museum this morning, getting in line behind dozens of others to buy our tickets—a bargain at $3.00 each (senior admission). Maps on the wall near the entrance sported push pins showing the hometowns of the museum's most recent visitors. 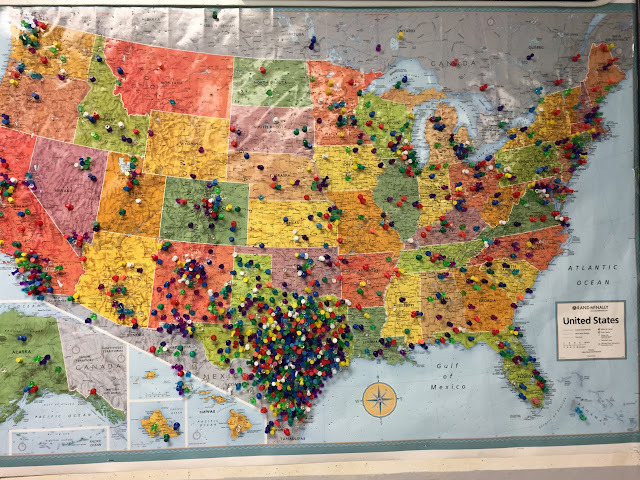 Having seen many vehicles with Texas license plates parked outside, we were not surprised to see that state filled in completely on the map. The world map had fewer pins, but every continent except Antarctica had been pierced. Exhibits clearly lacked the touch of a professional curator, and most appeared to date back to the museum's opening, but the horde of visitors did not seem to mind in the least. Alien figurines were attracting the most attention but many guests were taking time to read some of the newspaper articles and other documents on display. 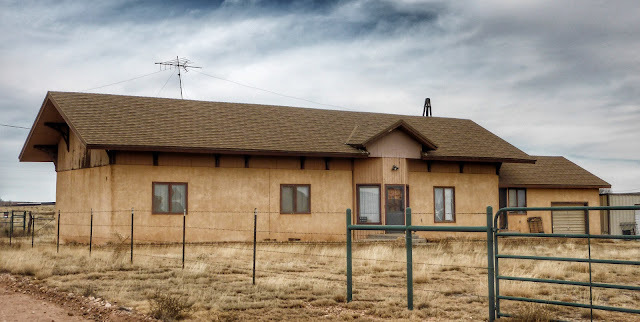 The research library, filled with books and other media about UFOs and extraterrestrial life, remained visitor-free—except for two people who went there to find a letterbox. 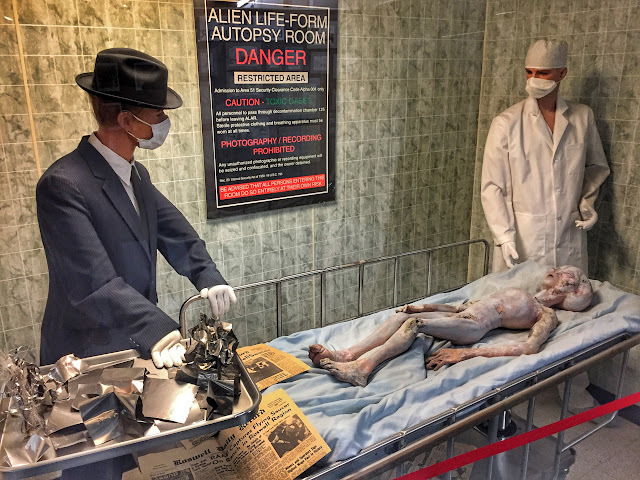 FORTUNATELY THE DANGEROUS ALIEN AUTOPSY ROOM WAS BEHIND GLASS. 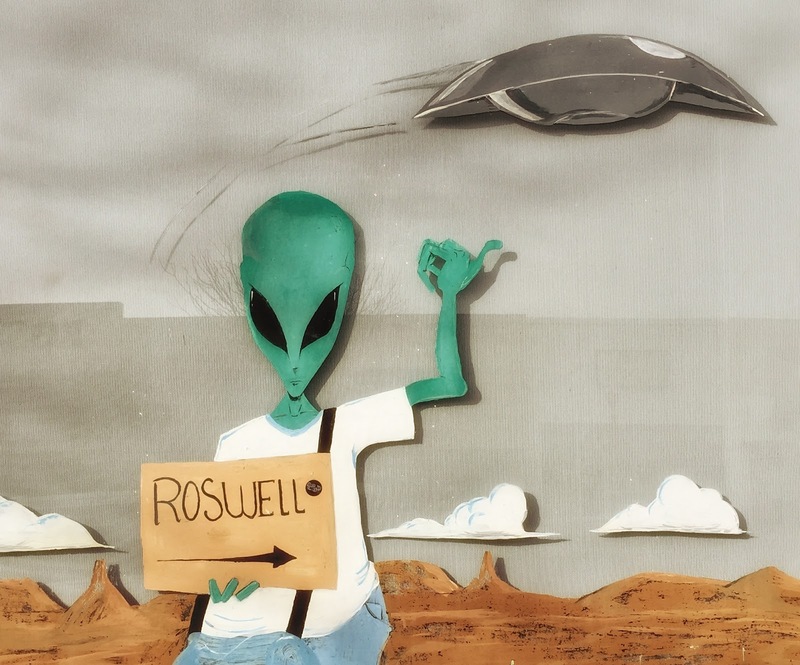 When we began to feel alienated from reality, we knew it was time to leave Roswell and drive on toward home. 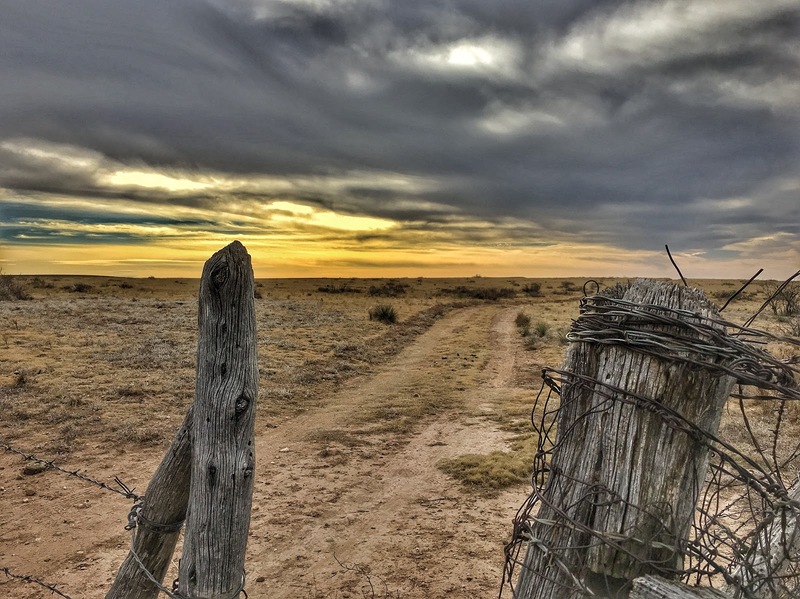 We set out on US-70 to complete the final leg of our journey across New Mexico. 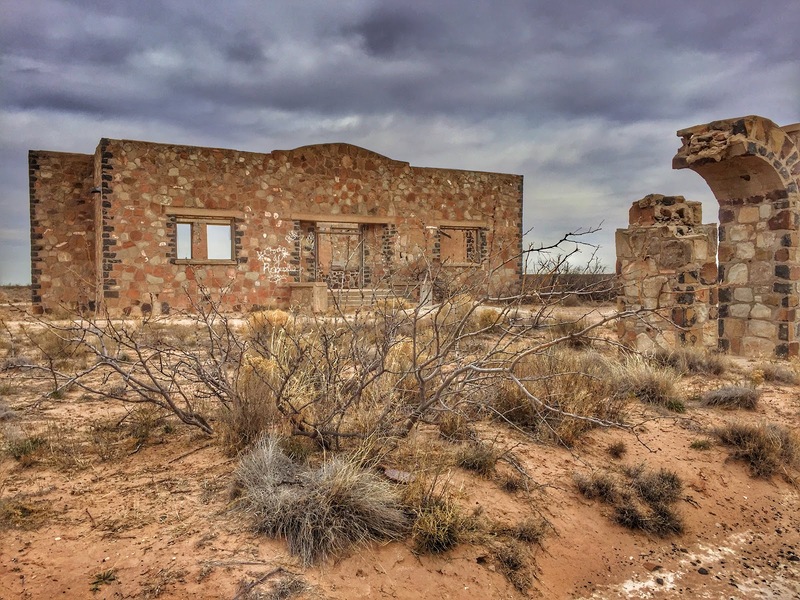 A bit of research informed us that this largely empty 110-mile flat stretch was a letterboxing desert, with not a single box between Roswell and Clovis, so we determined to hide one along the way. Letterboxes weren't the only things in short supply along this northeasterly route. 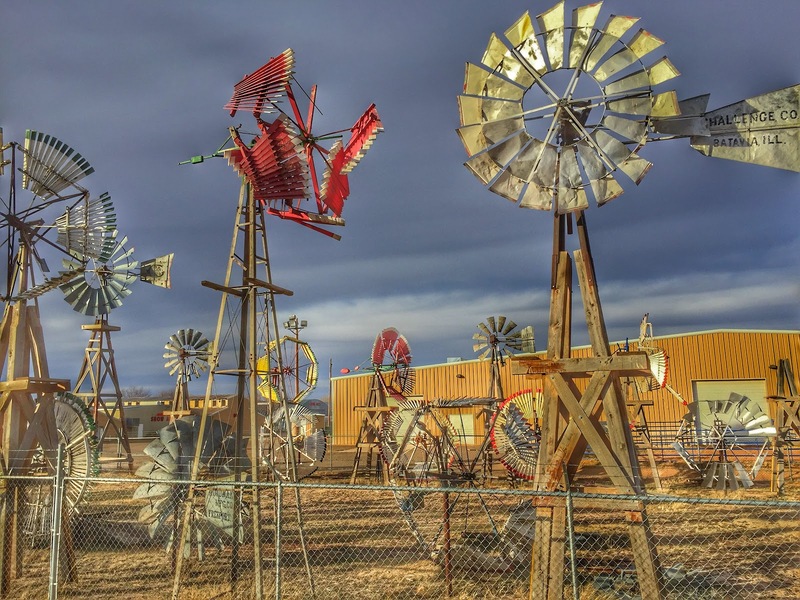 There were no roadside attractions, no state parks, and virtually no intersections between what used to be towns. Looking on the map, we selected the "town" of Kenna, about halfway between Roswell and Clovis, as our target to plant a letterbox, not realizing until we arrived that it was little more than a ghost town. 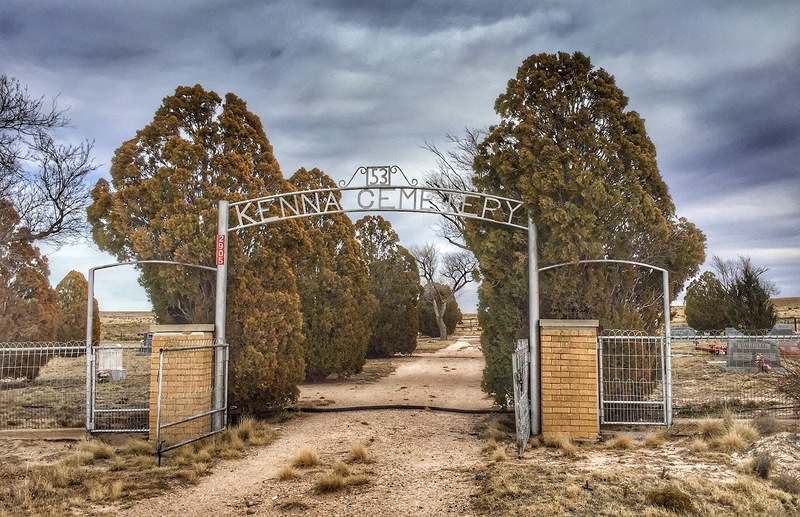 Kenna was once a thriving rail center, with thousands of cattle driven to its stock pens for shipment to market each year. 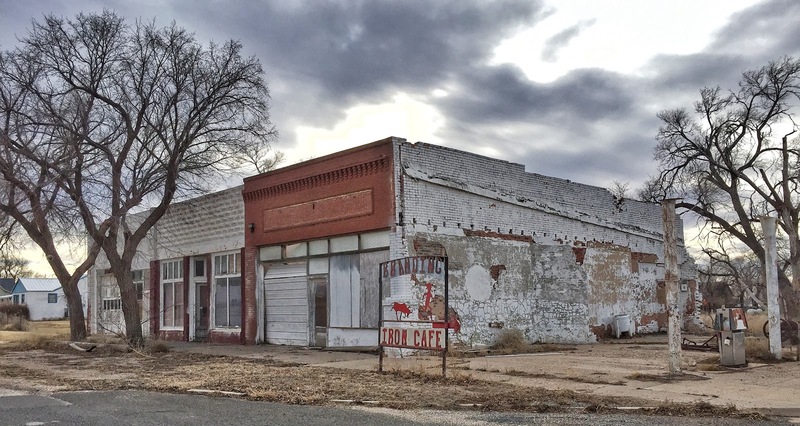 But like so many American towns dependent on rail traffic, its fortunes declined when well-developed roads drove a nail in the coffin of train service. An old brick gas station, known as the Midway Service Station, built on US-70 in 1939 is Kenna's last standing commercial building. 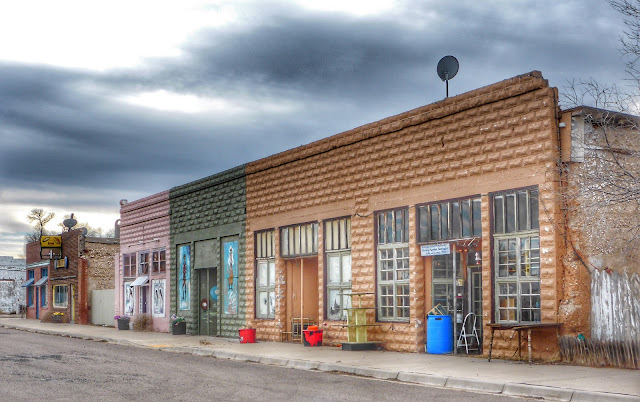 In 1993, local Maurene Howard moved her contract mail post office to the back of the building and opened a little store in the front. This final vestige of Kenna's once vibrant life serves as a community gathering place where the handful of remaining residents stop by to chat, to attend Bible study classes, or to buy a cold drink and slice of homemade cake. Though gas is no longer sold at the station, Ms. Howard sometimes has a few five-gallon containers of fuel for motorists who become stranded. We stopped and chatted with the elderly shopkeeper, trying to learn about the town's history and current status. She seemed a bit leery of us and all our questions. Finally we attended to her nonverbal cues and departed to look for a place to hide a letterbox. There's so little of the town left—even the old depot was moved and converted into a home—we finally decided on the tiny Kenna Cemetery on a dirt road off US-70. 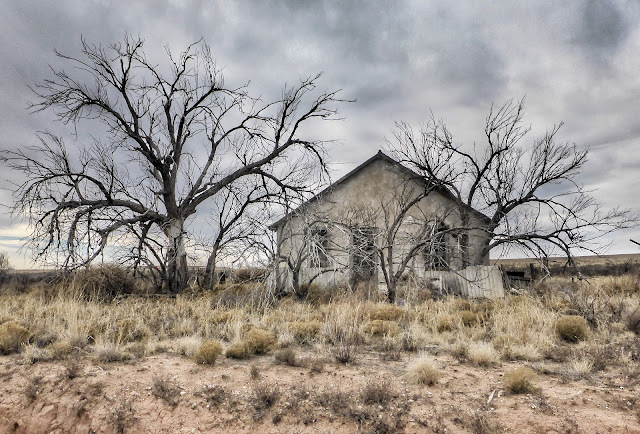 As it had been the entire route, traffic was light on the divided highway as we continued ten miles east to Elida, another town that appeared to be abandoned though more recently than Kenna. 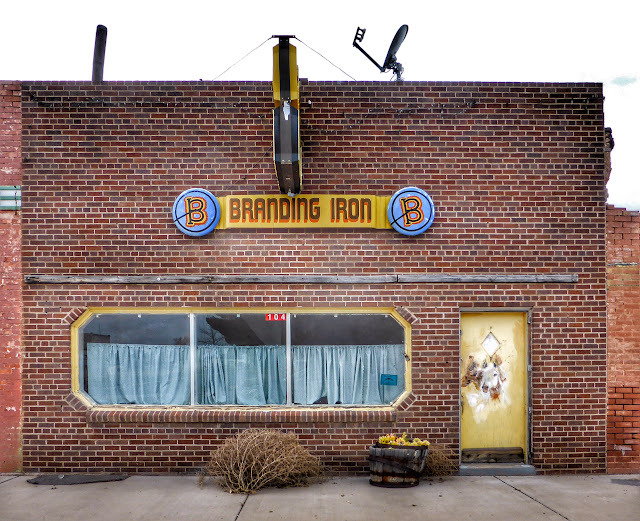 A prominent sign next to empty storefronts along the highway advertised the Branding Iron Cafe. We weren't looking for lunch as we'd had a picnic in Kenna, but we were curious about the restaurant since we saw no sign of life in any other building. When we reached the cafe, it was closed also with a large tumbleweed resting against the building under curtained windows. Upon closer examination, we realized that the Branding Iron probably won't be open for business any time soon. The entire roof had collapsed and was sitting in the middle of the dining room. Nearby, colorfully painted buildings made a semblance of a retail district. 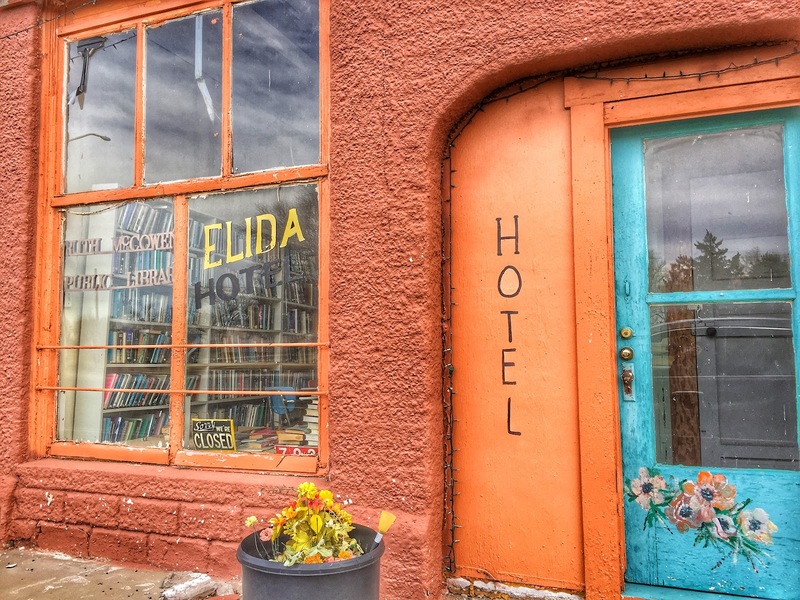 In one, a flea market collection of dusty items were visible through grimy windows, with some having spilled out onto the sidewalk in front. Others in the row had no space for merchandise because their interiors were filled with the roof and rafters that had crumpled inside. 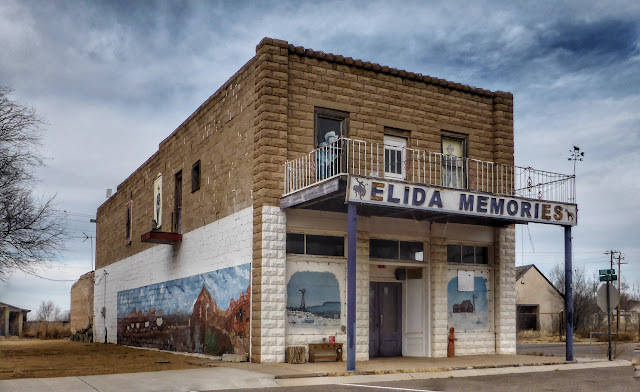 We drove around the little town for about fifteen minutes mid-afternoon on a Wednesday, taking photos, peeking in shop windows, and trying to figure out how far Elida had slid down the slope to ghost town status. We did not see one other person, nor any other vehicles. According to our later research, we discovered that the town still operates an independent municipal school district for 124 students in two schools—one elementary and one secondary. So there are still people in Elida; they just weren't around town today. Twenty-five miles further east on US-70 brought us to Portales (pop. 12,280), quite lively after all the ghost towns we'd been seeing. 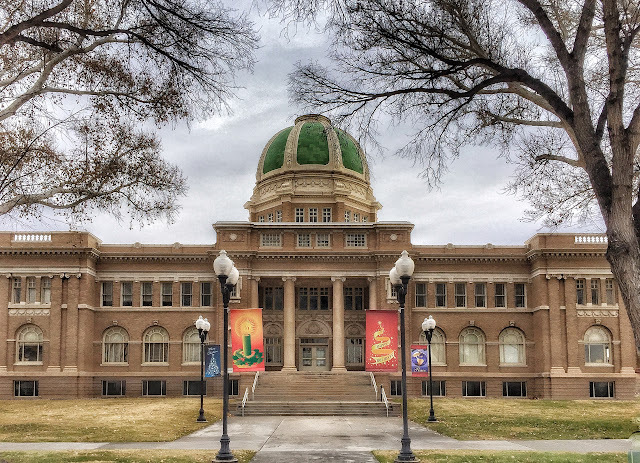 The county seat of Roosevelt County, Portales is also home to Eastern New Mexico University. 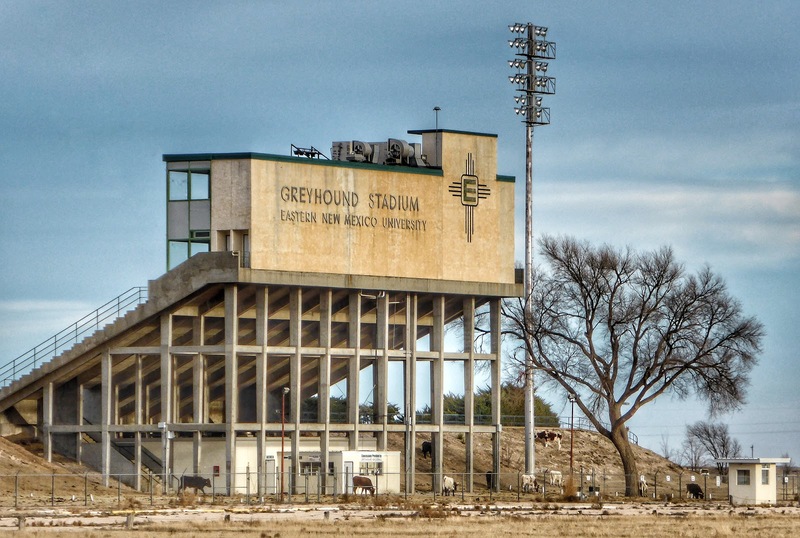 As we passed their Greyhound Stadium, we observed their underpaid grounds crew at work. WHEN'S THE LAST TIME THESE WORKERS HAD A RAISE? By the time we reached Portales, we were ready to call it a day, so we didn't linger there but finished off the last 20 miles to Clovis (pop. 37,775), our destination for the night. Ken's cold was getting no better and seemed determined to go through its entire cycle despite the Zicam he was feeding it. Tomorrow we hope to cross Texas and get into Oklahoma as we accelerate the pace of our return home. Sight seeing loses its luster when you don't feel well.